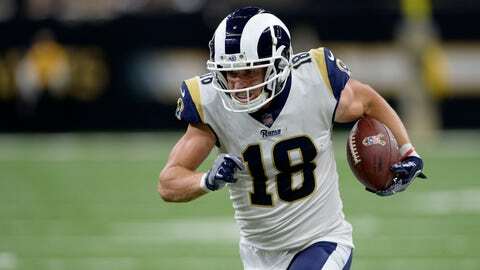 THOUSAND OAKS, Calif. (AP) — Los Angeles receiver Cooper Kupp is out for the season after tearing a ligament in his left knee, depriving the Rams‘ offense of a major contributor heading into a showdown with Kansas City. Coach Sean McVay on Monday confirmed the ACL injury for Kupp, who led the Rams in yards receiving last season. Kupp is likely to have surgery this week. Kupp has 40 catches for 566 yards and six touchdowns this season, providing reliable hands in the slot and a knack for big catches. The former third-round pick from Eastern Washington has been a key contributor to McVay’s high-octane passing offense in both of his NFL seasons. His absence will be felt right away by the Rams (9-1), who will be without one of Jared Goff’s most familiar targets when they face the Chiefs (9-1) in Mexico City next Monday night in one of the biggest games of the NFL’s regular season. Kupp was hurt on a play with minimal contact Sunday in in the fourth quarter of the Rams’ 36-31 victory over the Seattle Seahawks. An MRI exam confirmed a torn ligament for Kupp, who already missed two games last month with a sprained left knee after going down awkwardly on a horse-collar tackle by Darian Stewart in Denver. McVay is optimistic about the Rams’ ability to fill Kupp’s role with a mix of receivers. Robert Woods, who leads the Rams with 55 catches, is likely to play more frequently in the slot. Fellow starter Brandin Cooks, who leads LA with 857 yards receiving, is likely to get more balls thrown his way after catching a season-high 10 passes against the Seahawks. And second-year backup Josh Reynolds is certain to get more playing time, particularly against the Chiefs. Reynolds has just seven catches this season and just 18 receptions in his 26 career games, but the former Texas A&M star has earned the Los Angeles offense’s trust while filling in for Kupp earlier this season. At 6-foot-3, he also provides a different size matchup on the outside compared to the smaller Cooks and Woods. The Rams also could get receiver Pharoh Cooper back in their lineup soon. Last season’s Pro Bowl kick returner has been sidelined since the season opener with an ankle injury, but McVay indicated the Rams are likely to make a decision this week on activating Cooper from injured reserve. The Rams have been largely healthy this season, with a few glaring exceptions. Along with Kupp’s struggles and Cooper’s season-long absence, Los Angeles has been without cornerback Aqib Talib for the past seven games due to an ankle injury that required surgery. Talib said Monday that he still hopes to return when the Rams face Detroit on Dec. 2 in their first game back from their bye week. Talib also praised his replacements in the secondary and had encouraging words for fellow starter Marcus Peters, who criticized himself after last week’s loss to New Orleans.